How long is a piece of string? As long as you cut it! Iceland is bigger than you think, and bigger than it looks! We get a lot of questions about how far away some things are. To help clear all of this up, we put together this post about about the typical driving distances in Iceland to the major attractions from the capital city of Reykjavik. Travelling can take a deceptively long time in Iceland. There are only very small patches of straight road, it’s quite windy, and if you think you can get some one side of the Iceland to the other by “cutting through the middle”, then you got another thing coming! It always takes longer to drive anywhere in Iceland in winter. Remember to plan ahead and not cut things too fine. If the weather is bad, always add an extra 10-15 minutes for every hour of driving. You may have to stop altogether if the wind is too strong and wait for it to die down. 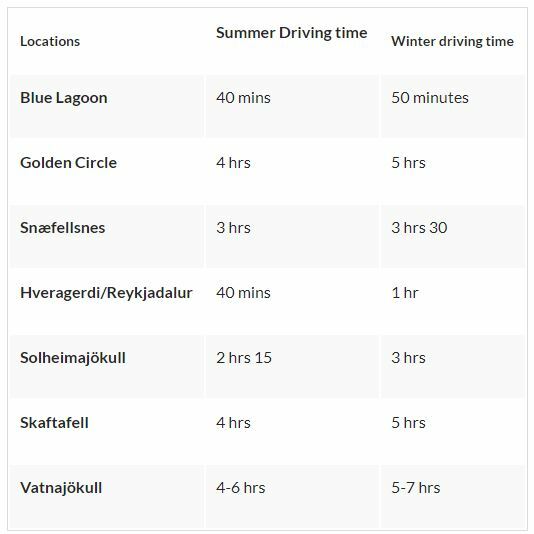 Check out the table below for summer and winter driving distances in Iceland, with descriptions for each following below. You’ll have passed the Blue Lagoon on your way in from Keflavík airport. From the airport, it’s a short 15 minute drive. From Reykjavík, it’s about a 30 minute drive. You can’t see it from the road, you have to take the left towards Grindavík, or grab the exit to the right to Grindavík if you are coming form the airport. The Golden Circle is one of Iceland’s most popular tours and is made up of three Iceland attractions, listed below. • Thingvellir National Park - from Reykjavik to the park entrance is just a little over 40 km. Allow an hour for this. • Geysir - From Reykjavik to the famous Strokkur geyser, the distance is about 100 km, which will take you about an hour and 20 minutes. • Gullfoss - Slightly further than Geysir is Gullfoss, about another 10-15 minutes from Geysir. This area is known as the valley of hot springs and it is a popular place to hike and bath in natural hot springs where a hot and a cold river meet for a nice warmth. The driving distance to the valley from Reykjavik is about 45 km and this will take you about 40 minutes. A popular glacier for Glaicer Tours, is 164 km south of Reykjavik and the drive time is about 2 hours and 15 minutes. Located within Vatnajökull National Park, and is one of Iceland’s most popular camping locations. From Reykjavik, the distance to the park entrance is about 322 km and the drive time is 4 hours, but allow 4 hrs 30 mins or 5hr if the weather is bad. Providing accurate driving distances to Vatnajökull is a bit tricky. That’s because the glacier is immense and covers a little over 11% of Iceland’s land mass. Getting to the outer edges of this glacier is really the same as the driving distances to Skaftafell as it is just beyond the park. If you kept heading East, you would be driving with it on your left for many hours. No matter where you are in Iceland or how much time you have, you are never far away from a great adventure and getaway. Our roads are beautiful, and sometimes just driving down them feels like enough. Having said that, the adventure always truly begins when you step out of the car.